Lofty ideal, or Real possibility? In today’s times, when we are bombarded with seemingly endless stories of senseless violence, it is hard to imagine a world of peace, much less create one. Yet this was the theme for the AYUDH 12th European youth summit. 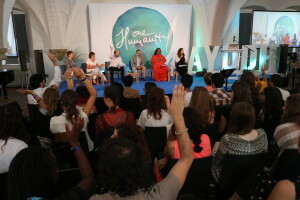 AYUDH is Amma (Mata Amritanandamayi)’s global youth organisation, which in collaboration with the UN and EU Commission hosted a one-day symposium on ‘One Humanity’, exploring how to engage youth in building peaceful and inclusive societies. 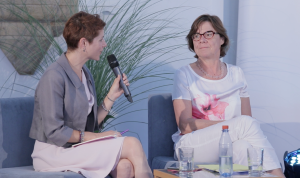 With close to 400 young people from across Europe, I was honoured to moderate a panel with distinguished guests from across all spectrums – Mme. 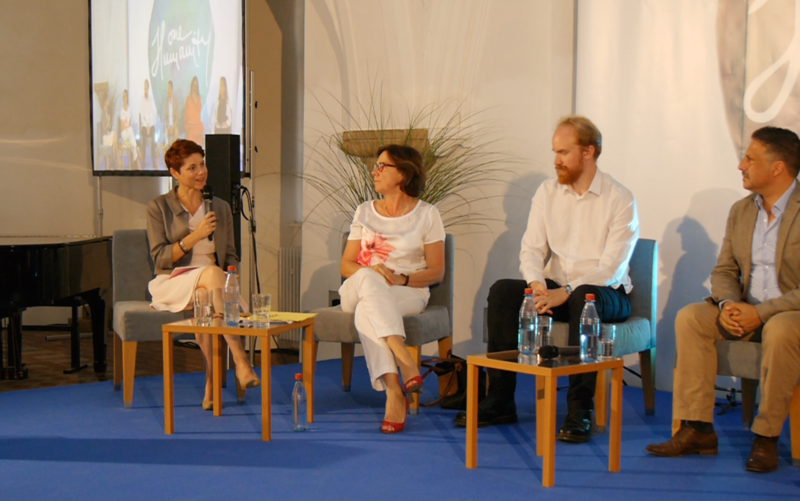 Martine Reicherts, Director General for the EU Commission on Youth, Education and Culture; Indra Adnan of the Soft Power Network, Bjørn Ihler, survivor of the Utøya massacre and advocate for peaceful and inclusive responses to extremism, Ernesto Marinelli – VP HR EMEA for SAP and Amma’s most senior disciple, Swami Amritaswarupananda. We have the largest youth population in our history, with 1.8 billion young people between the age of 10 and 24 (as of 2015). This creates an enormous opportunity in terms of economic and social progress across the world, but only if we can engage with this sector of the population to create a more just, peaceful and inclusive world with opportunities for all. It is in the acceptance – and celebration – of our individual uniqueness that we will be able to truly create ‘one humanity’. Paradoxically it is only by celebrating our individuality that we can honour the unity in diversity. Pretending to all be the same for fear of not being accepted for who we are prevents others from being authentic also. Ernesto Marinelli shared his own personal story and of how important it is to him that SAP embraces diversity within its culture. We can change our narrative and the stories we are telling ourselves about division and separation in the world. With Mme. 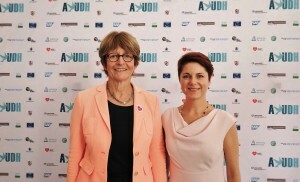 Anne Brasseur, Council of Europe Ambassador for the No Hate Speech Movement. Young people can make a huge difference – drowning out the media noise by using social media in a positive way and creating a new narrative that creates an inclusive world. The European No Hate Speech Movement was launched to highlight this. It is also by telling our own stories that we are able to recognise each other in ourselves. We need to develop the courage to face and act on our convictions in a direct but non-confrontational way. Curiosity and enquiry are essential traits that need to be developed and actively encouraged, and Indra Adnan raised the prospect of a ‘politics of love’ rather than a politics of fear. Change in the world has to start with change within. We have to start with our own prejudices and fears, and have the courage to address them rather than bury them. Swami Amritaswarupananda talked of the ‘inner-net’ (the connection to our inner world) needing to be just as powerful as our connection to the internet. Creativity and movement are powerful expressions of humanity that transcend cultural divisions and verbal language. Young people were able to demonstrate the importance of care, support and listening through a spontaneous embodiment exercise that highlighted the power of what happens when we go beyond words. It is only by connecting to who we are as human beings – ourselves and others – that we will be able to truly create ‘One Humanity’, the collective whole that celebrates our diversity and creates equal opportunities for all. It was such an inspiring day, one filled with possibility, excitement for a more positive future, and a true meeting of hearts and minds. 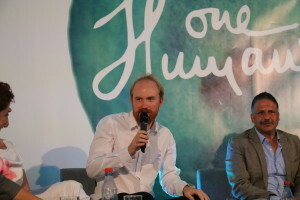 Bjørn Ihler, sharing his insight into countering extremism. Most inspiring of all, for me at least, was Bjørn Ihler’s account of his experience as a survivor of the Utøya massacre, and his compassion for Breivik. Telling his story on the 5th anniversary of the attack, his courage touched me deeply and it is his message of not de-humanising extremists, of not hating but understanding what truly drives them that stays with me still. Extremism of every form is our main challenge today and it is only through dialogue, openness, tolerance and true inclusion that we will be able to create a more peaceful future. Whether you consider yourself a ‘young person’ or not (! ), I invite you to apply these principles to your life – the world will be a better place for it. Home » Enlightened Business Practice » One World. One Home. One Humanity.